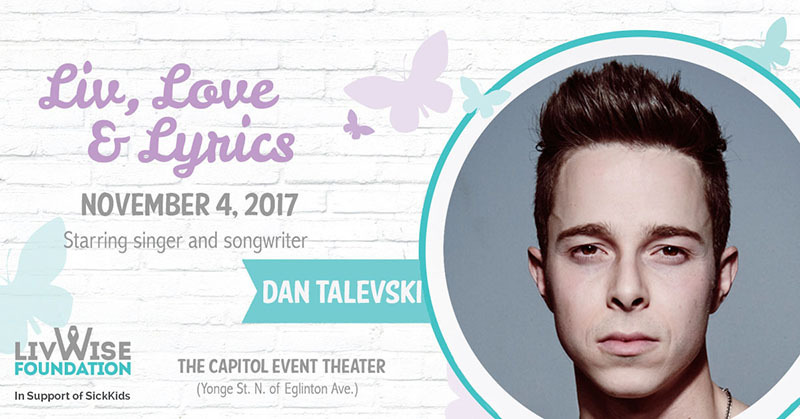 A celebration of life and love set to the exhilarating soundtrack of this year’s headliner, Dan Taleveski, will inspire and thrill at the fourth annual Liv, Love & Lyrics Concert. It all goes down on Saturday, November 4 at The Capitol Event Theater, 7:30PM. Visit www.livwisefoundation.com or Snap’d for tickets. Olivia Wise, a loving and talented 16-year-old girl from Toronto, tragically passed away four years ago from brain cancer. Prior to her passing, Olivia had the opportunity to fulfill her dream to record a cover of Katy Perry’s “Roar”. The video garnered national attention, including that of Perry herself. The LivWise Foundation was created to give sick children like Olivia the chance to live their dreams just like she did by raising funds in support of care and research programs. Liv, Love & Lyrics is a night of inspiration, entertainment, and tribute to that end. All proceeds from this year’s concert go towards the next stage of a special research study of BMMRD glioblastoma brain tumours at SickKids Hospital. Dan Talevski is this year’s concert headliner. A simple post on YouTube in 2007 lead to millions of views and the birth of Dan’s career. He’s been groomed for stardom alongside Justin Bieber, toured with The Backstreet Boys and worked in the studio with will.i.am. In addition to his own hits "Guilty as Sin" and "Knock Me Off My Feet", Tyler Shaw, Shawn Desman, and Keshia Chante sing songs he’s written for them. Today, Dan is signed to eOne Records, basking in the success of his newest single “Birthday Suit”, and poised to take his rightful place as Canada’s next musical sensation. Tickets include admission to the concert and a delectable array of delicious eats throughout the evening. The cost is $80 for general admission; $50 for a limited quantity of specially discounted student tickets. For all ticket and event information please visit: www.livwisefoundation.com or Snap’d.